Scholarship in the area of Chinese Bible translation history has been devoted primarily to the production of the UNION VERSION. This book will examine a significant, yet much overlooked Chinese Bible translation project produced by William Dean (1807–1895), an American Baptist missionary to the Chinese people in Siam and China. 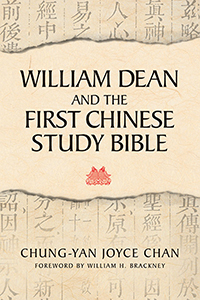 Decades prior to the UNION VERSION, Dean pioneered the production of an annotated Chinese Study Bible. He was convinced that sound translation alone was inadequate for cross-cultural audiences who were unfamiliar with the Christian religion to gain a correct reading of the Scripture, particularly in light of the heresies being spread by the leaders of the Taiping Revolution (1851–1864). Because of this conviction, Dean provided extensive commentary to his Bible translation despite the potential of “violating” Bible production principles set by the Bible societies. A second major controversy of the book associated with Dean’s translation word choices in relation to “baptizo” and the “name of God.” Dean’s particular word choices reflect his effort to contextualize the Christian message culturally and socio-politically, and to establish the Bible as an authoritative text in the Chinese intellectual tradition. His annotated Chinese Study Bible pioneered Chinese Biblical scholarship and exerted strong influence on the work of subsequent Chinese Bible translators. This study utilizes extensive primary sources in both the English and Chinese language from the American Baptist Historical Society Archives and the Bible Society Library at the Cambridge University Library. Published jointly with the Acadia Centre for Baptist and Anabaptist Studies.